The previous post explained that the solution-focused approach can be seen as facilitating the process of clarifying the better past and better future and to help build the bridge between the two. Although, in theory, this sounds pretty straightforward it can be hard to do in practice. That is why I'll provide some suggestions on how it can be done. 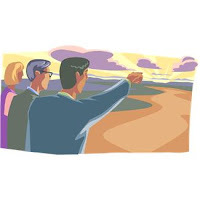 This post focuses on how you may help your client develop a clear picture of a better future. Outcome: when the client has agreed that he of she would like things to be different the coach may ask the miracle question or the desired situation question, for instance like this: "How would you like things to become?" By using these three small steps the client will usually experience this shift of perspective from negative to positive as quite natural. Step by step, the solution-focused coach helps clients to shift their perspective on their reality. Leapfrogging: when clients keep talking about the problem or about some preferred approach you may invite them to leap directly to the desired state by asking something like: how will things be better when the problem is solved? From emotional stated to visible behavior: When people express themselves in emotional terms you may ask questions to help the client take the shortest route to translate them to positive and specific behaviors so that the outcomes desired will be very specific. Perspective-change technique: With this technique you basically ask the question: ‘How would others notice that things were different?’ This helps makes it easier for people to take a wider angle and to look at their situation more objectively. Also, it is likely to have a strong motivational effect to help people view themselves from a third person perspective. Visualizing desired outcomes: a great way to help clients form specific goals is to ask them to describe the desired situation as vivid and visual as possible. 3. Knowing when to proceed: talking about the better future is done very patiently and may take much longer than beginners expect. Encouraging clients to keep talking is therefore important. Then, how do you know when can go beyond talking about the preferred future and proceed in the conversation? I think there are two types of indication that the client has said enough about his better future. Positive behavior descriptions: once the client has described visually, positively and vividly what he or she will do in the desired situation, it is very likely he or she will have found some ideas for steps forward and will want to start to move in the desired direction (read Supporting Clients’ Solution Building Process by Subtly Eliciting Positive Behaviour Descriptions and Expectations of Beneficial Change). Non-verbal behavior: although solution-focused practitioners, generally, do not verbalize the non-verbal behaviors of their clients ("from the look of your face I can tell you don't find this useful") they do perceive them and can use them. When a client's perspective is shifting from negative to positive, this is clearly reflected in their non-verbal behaviors. At first they may look sad or angry, and they may frown or sigh. Gradually, as the shift is taking place, their facial expression usually changes. They start to smile, the melody of their voices begins to sound more enthusiastic, and they may nod and sit up straight. Usually, when the picture of the better future begins to become very specific, this is when clients display this type of non-verbal behavior. That is usually a good indication that you may proceed in the conversation, for instance by exploring the better past (past successes and/or exceptions to the problem). Hi Coert It has been awhile since Ive posted. I have been working on graduating from school and I finally received my registration number as a marriage and family Therapist intern! Hi Joy, congratulations with your registration! I agree with what you say: developing both visual and verbal narratives may be very useful.